Miami Beach is known as the world’s playground. The sun, the surf, and all the excitement of the many types of entertainment, and the trendy fashion, are part of the attraction that makes Miami Beach a world class destination. The Art Deco architecture of South Beach is also extremely popular. 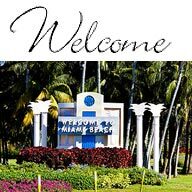 And when you visit Miami Beach you have all of South Florida to enjoy. From the shopping mecca of Downtown Miami to Broward County’s Sawgrass Mills, you will find an amazing choice of fashion, furnishings, electronics and just about everything you can imagine.